We continue to stay invested in equities with your full capacity and buy on all dips. With stable government in place, its start of good times for Indian economy and equities are going to outperform all other asset class for next couple of years. We continue to remain invested in good companies with strong fundamentals and now shifting our focus from IT and pharmaceuticals to cyclic and domestic consumption companies which are expected to perform comparatively well in near future. 2013 was a good year for equity investors who invested in high quality companies reporting 20-30% + annualized growth. This helped companies to got their due share of re-rating and delivered exceptional returns to the shareholders. In case you have not yet started building a portfolio of high quality and high growth stocks for long term wealth creation, please find below the Wealth-Builder portfolio allocation for your reference. The same was shared with our Wealth-Builder members today. We believe, investing in Wealth-Builder portfolio with regular portfolio review from our end can help you achieve market beating and very good returns over a longer term and help you take care of yourself and your family needs, which ultimately lead to a healthy and wealthy life after retirement. Since inception, our Wealth-Builder portfolio has outperformed Nifty and Sensex by wide margin. Since 1st Jan 2013, Nifty has given returns of 27.4%, Sensex returns is 29.7% where as Wealth-Builder portfolio has given returns of 96.6% returns to our members. Wealth-Builder 6 top performer stocks out of 13 have given returns in the range of 70% to 250% since 1st Jan'13. We continue to hold these stocks as we believe these companies are registering good growth every quarter and doing all the right things to continue delivering robust top line and bottom line in coming quarters. There are few laggards also which have not performed up to our expectations and are giving marginal positive or negative returns in Wealth-Builder portfolio as on date. Absolute Wealth-Builder returns is 90.1% as we booked loss in few of non performing companies during 2013 and 2014 and added few other stocks in beginning of this year. Wealth-Builder portfolio update has already been mailed to our members. We have total 13 stocks in our Wealth-Builder portfolio as on date. We decided to make further changes in our Wealth-Builder portfolio after the sharp rally seen during last 3 months. We believe that rally may continue with stable government in place and any correction must be considered as a buying opportunity. We expect that Rupee will continue to strengthen which may impact margins of major exporters - IT and pharmaceutical companies. Hence, we have reduced portfolio allocation from IT taking higher exposure in cyclical and domestic consumption companies. 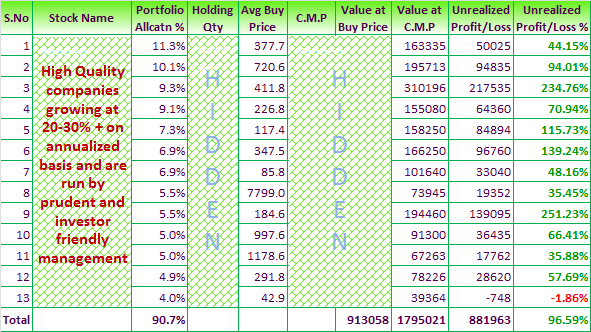 We have already published Wealth-Builder 10 Lakh Rupee portfolio - Apr'14 and shared it with our Wealth-Builder members on 06th Apr'14. Wealth-Builder subscribers need to replicate our recommended portfolio in exact proportion. For ex: If we recommend to invest Rs 50,000 in “x” company with portfolio allocation of 5% in Rs. 10 lakh portfolio, subscriber starting his portfolio with Rs. 2 lakh need to invest Rs. 10,000 in “x” company with similar portfolio allocation i.e. 5%. Start managing your equity portfolio like a professional, subscribe to Wealth-Builder by paying nominal annual fee of Rs. 15,000 for entire year. To subscribe to our Wealth-Builder services, click here. To know more about our services and annual subscription charges, click here.